The ultimate source for information on boating equipment and the boating lifestyle. Boating World Magazine has 8 issues per year to bring you articles on watersports, fishing, trailers, PWCs, and more, for owners of boats up to 30 feet. 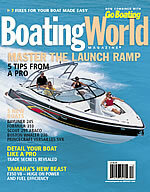 Also included are tips on maintenance and repair, as well as new boat and product reviews.